that the focus be on inside activities. 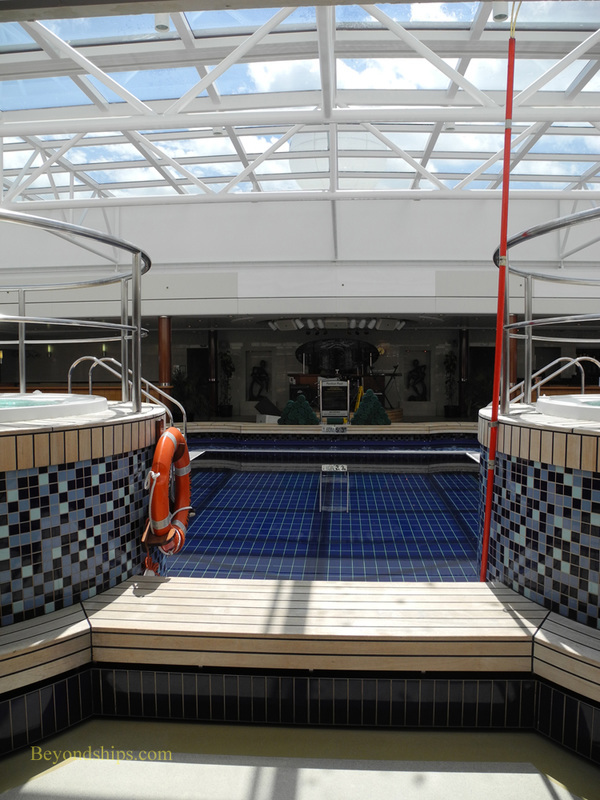 the open decks are populated with passengers. The Top Decks. 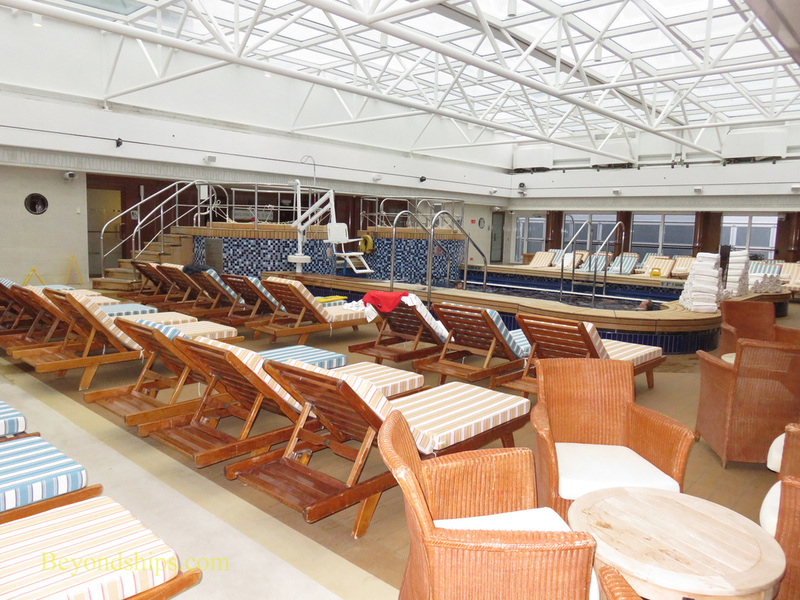 The public areas on top of QM2 are located on Deck 13 (forward) and Deck 12 (aft). 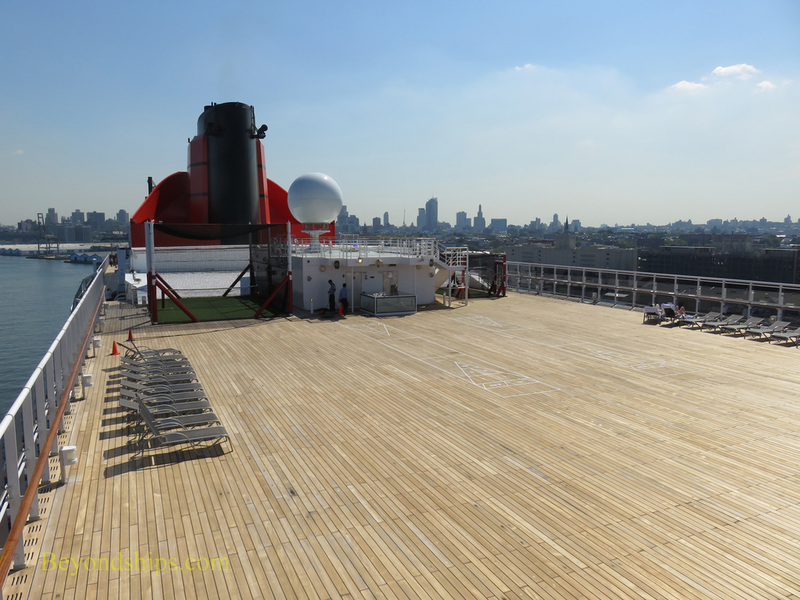 This area was significantly changed during the 2016 Remastering as the addition of cabins on Deck 13 required the relocation of some of QM2's sports facilities. If one were to walk from fore to aft, you would not reach any sports facilities until about midships. 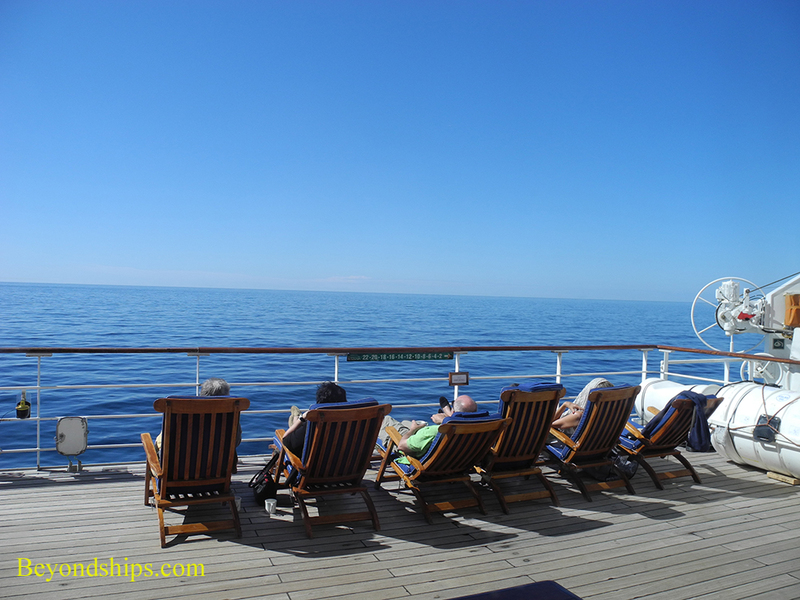 There, you would find a great expanse of open deck. On sunny days, this area is populated with deck chairs. 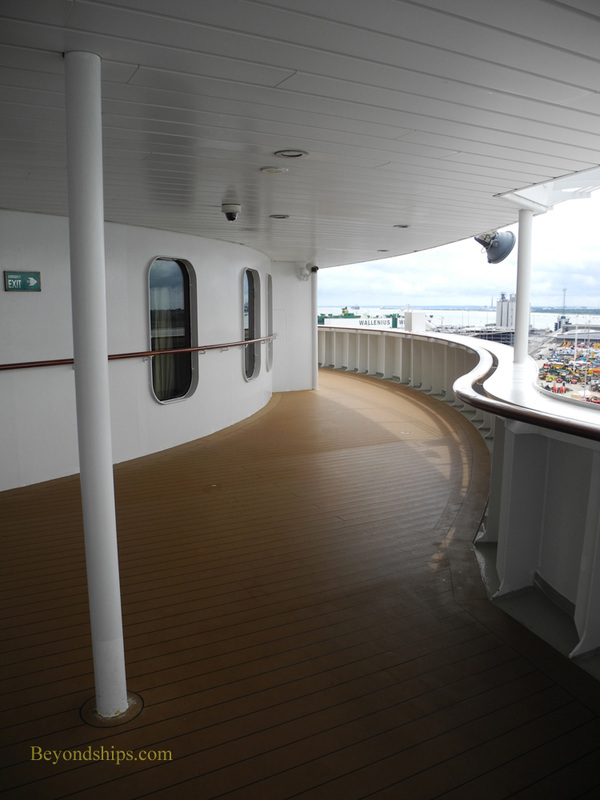 Passengers can also play those traditional passenger ship games quoits and shuffleboard in this area. On warm evenings in the topics, it can be the scene of star gazing lectures by visiting astrononers. ​Also in this area now are golf nets and the outdoor sports centre. A little further aft, one comes to the Pavillion Pool. (above). This area is sheltered by a retractable glass roof. It has a pool, two whirlpools, and a bar. The ship's computerized golf simulators are just off this area. 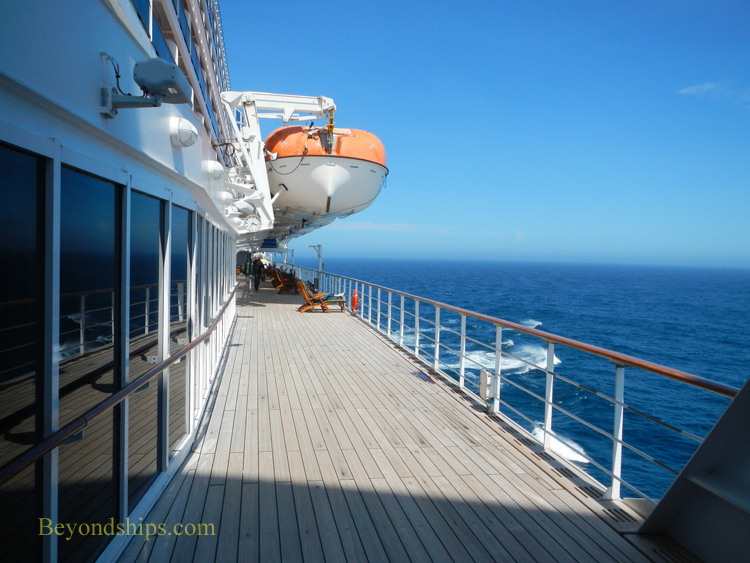 ​One of the things that gives QM2 the look of a traditional ocean liner is that the after portion of her superstructure cascades downward in a series of terraces (right). 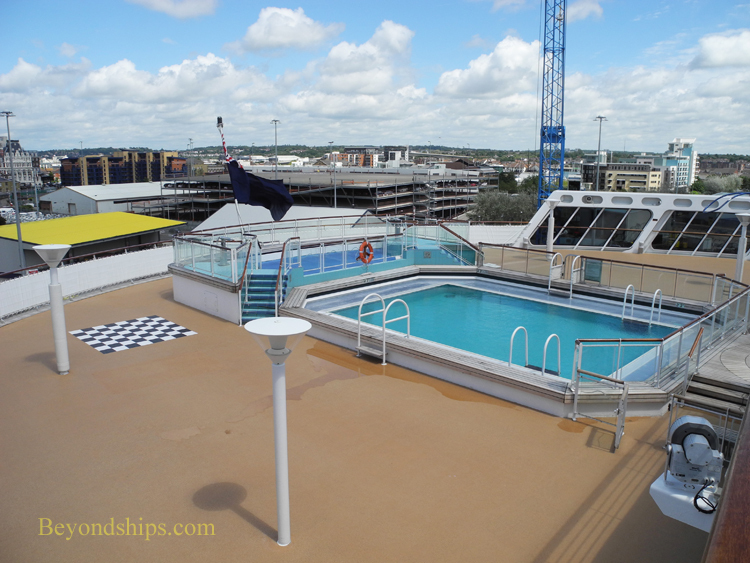 ​The highest level aft terrace has its own whirlpool and is reserved for the use of guests staying in the ship's suites (belowt). 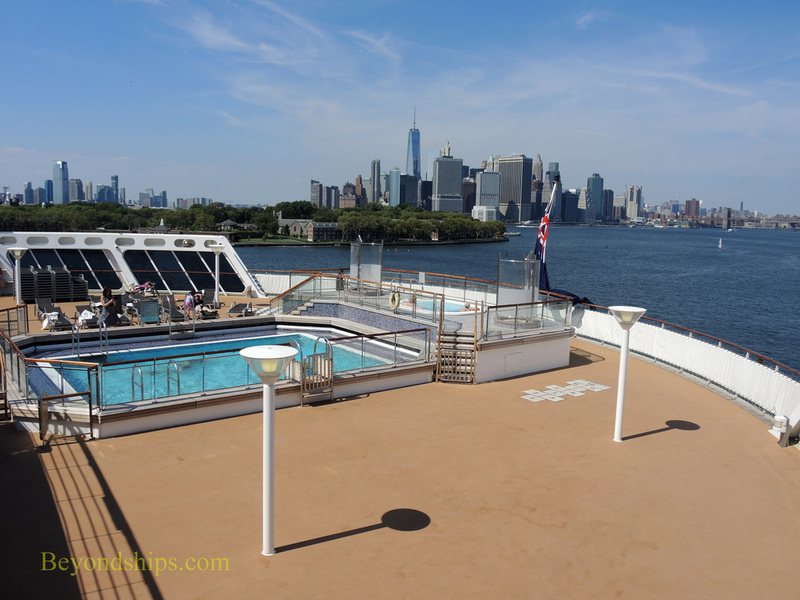 The main outdoor pool area is the Terrace Pool on Eight Deck. 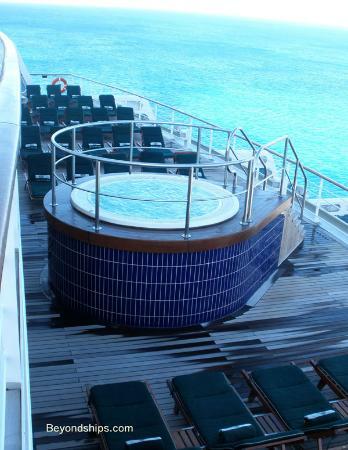 It has a pool, two whirlpools and is served by the Terrace Bar. The area has its own bandstand which is used during sailaway parties and during Caribbean deck parties. 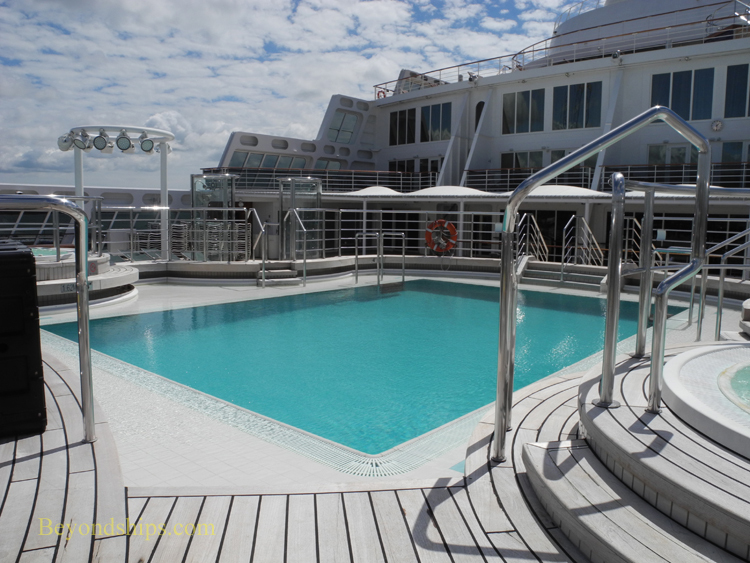 The final terrace is the Minnows Pool area on Deck 6. It adjoins the children's play area. walking or jogging laps. 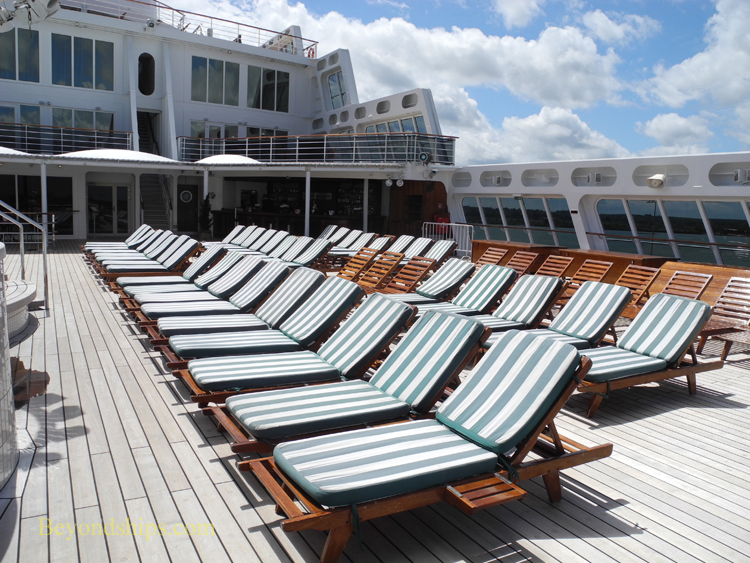 There are also padded wooden deck chairs for sitting and watching the sea. 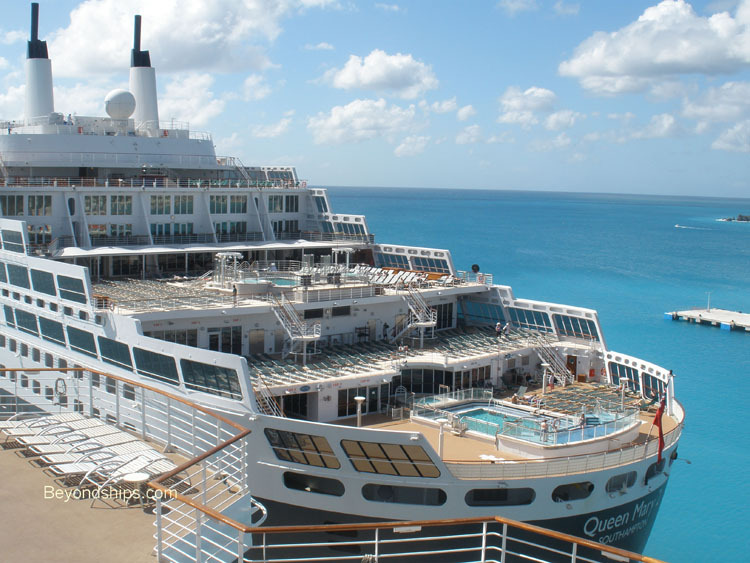 offers spectacular views especially when the ship is entering or leaving port. 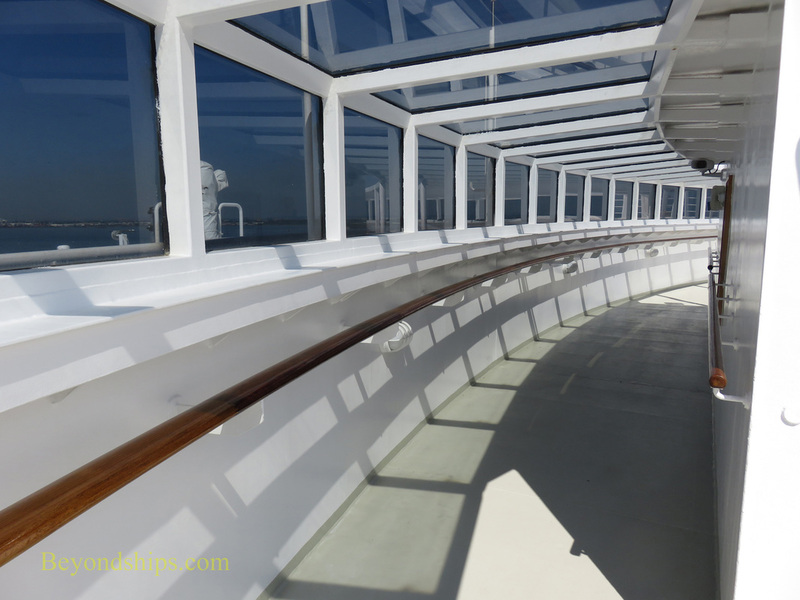 A few decks above on Deck 13 is another observation area, the Lookout. (above right).